The cabinet under our sink was a gross and disorganized mess. So while I was spending time painting the kitchen cabinets I resolved to do something about it. Part of my organization mission included a ten minute project to hang my kitchen gloves under the sink, more on that in a minute. First, here is what the cabinet under the sink looked like before I started. The shelf paper was old and grimy, I couldn't see or easily access half the cleaning supplies and I definitely couldn't reach the fire extinguisher quickly (see it hiding in the back left?). This was a project I really wanted to tackle but I was also dreading it. Seriously, have you ever cleaned and painted the under side of a sink? In my experience, under sink cabinets have always been gross. And cramped. And smelly. I don't know how plumbers can stand it, but I'm so thankful they do! First I hauled everything out, then I grabbed a beer (or two), the vacuum and some soapy water for a good cleaning. The clean out was followed by fresh paint and shelf paper. By the way, let me know if you need any shelf paper, I have 98% of a roll left over from this project! Here's what it looks like with fresh paint and some organizational elements. Ahhh, so much better! Goodbye yucky cabinet! 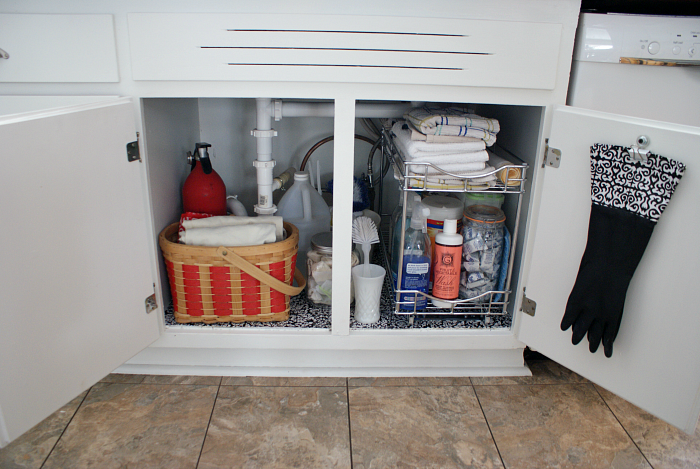 Hello clean and organized under sink storage! I purchased a chrome roll out drawer and it was a bit of a splurge, but oh my gosh it was so worth it! I can store twice as much stuff and have easy access to it. The bottom shelf holds everyday cleaning supplies, dishwasher tabs and plastic shopping bags (they're in a Snapware cereal keeper similar to this while hand towels are conveniently located on the top shelf. I also wanted a handy place to store our reusable shopping bags - they were previously hanging on a nail by the back door. 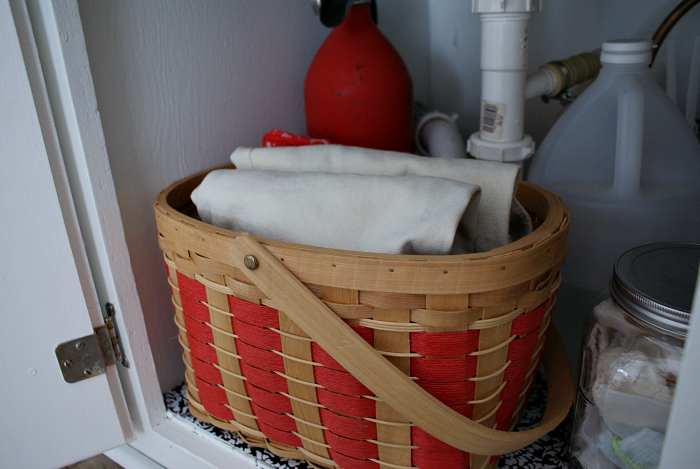 I found this this red woven basket at the Goodwill (my favorite place to find baskets!) and it's perfect for the job. Now for the nifty kitchen glove holder. I don't use my kitchen gloves very often, but on the rare occasion that I have manicured nails I like to keep them nice for as long as possible! Here's how to do this quick and easy DIY. All you need are two washers, a nut, a screw and a binder clip. Sandwich one end of the binder clip between two washers. Secure the nut, screw and washers in place using a drill. Easy Peasy! So that's my under sink makeover! Have you tackled any yucky storage areas lately? I'd love to hear about it in the comments! cute idea, we love using things we've already got around the house for new DIY projects!! Used your idea for gloves, but used a a fridge clip and hung it on a hook. Thank you for the idea!